Our September 8, 2018 event was held at the Waimea Center, a small shopping center in the town of Kamuela (Waimea). We had great weather throughout the event. Many club members in the area, along with a few who drove in from as far as Kona and Keaau, joined our event. They brought their cars and we had a good mix – Tesla Model 3, Tesla Model X, Tesla Mode S, Chevy Bolt, Nissan LEAF, BMW i3, VW eGolf, Chevy Volt and BYD SUV. Local Nissan and Chevy dealerships brought the 2018 Nissan LEAF and Chevy Bolt, respectively. They fielded questions from several potential customers and took several on test drives. Our local Citizens’ Climate Lobby representative, Ron Reilly, shared information about the Revenue Neutral Carbon Fee and Dividend concept. Our local utility (Hawaii Electric Co.) joined and addressed questions regarding their Fast Charging infrastructure and TOU program. They also brought along their BYD (Chinese) electric SUV. Ron Whitmore, Hawaii County Deputy Director, gave speech on sustainability and the role of electric cars in and presented the association with a letter of appreciation from the Mayor’s office. 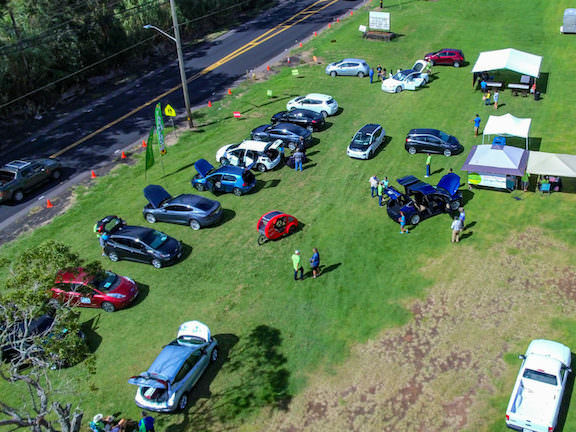 Thank you to the National Drive Electric Week organizers, KTA Superstores, Waimea Center, Ulupono Initiative, Citizens’ Climate Lobby, Ron Whitmore, and BIEVA volunteers for helping to make our event possible. Mahalo to Waimea Center, KTA and HELCO for letting us use the annex parking lot and your time involved in this event. Join the Big Island Electric Vehicle Association for this year's Drive Electric Week event in Waimea (Kamuela). This event will be held at Waimea Center's KTA parking lot (location of the Waimea Fast Charger). Registered attendees report 206,100 electric miles driven.